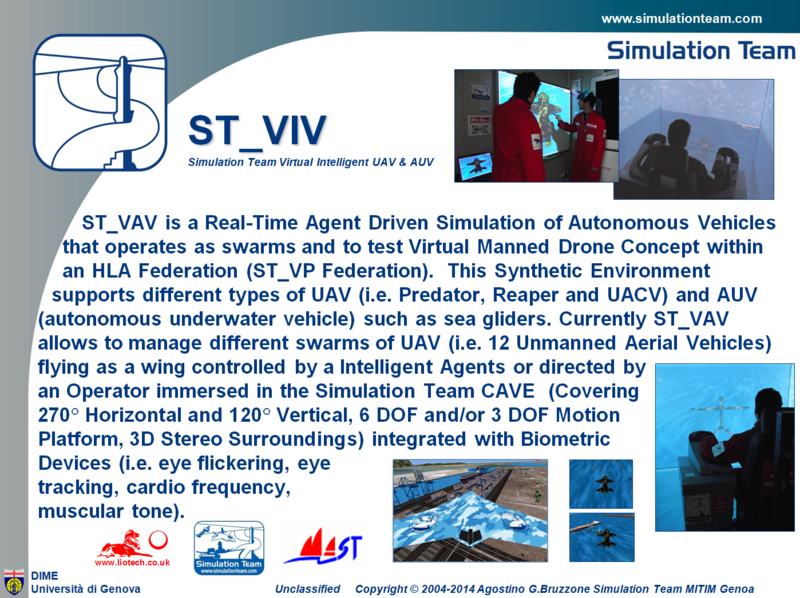 ST_VAV is a Real-Time Agent Driven Simulation of Autonomous Vehicles that operates as swarms and to test Virtual Manned Drone Concept within an HLA Federation (ST_VP Federation). This Synthetic Environment supports different types of UAV (i.e. Predator, Reaper and UACV) and AUV (autonomous underwater vehicle) such as sea gliders. Currently ST_VAV allows to manage different swarms of UAV (i.e. 12 Unmanned Aerial Vehicles) flying as a wing controlled by Intelligent Agents or directed by an Operator immersed in the Simulation Team CAVE (Covering 270° Horizontal and 120° Vertical, 6 DOF and/or 3 DOF Motion Platform, 3D Stereo Surroundings) integrated with Biometric Devices (i.e. eye flickering, eye tracking, cardio frequency, muscular tone).